Being a “sport” – many argue it is a game – mainly played in pubs and requiring little or no physical fitness, darts is one activity at which Britain excels! Darts is thought to have been created when soldiers began throwing short arrows at cut tree trunks or alternatively at the bottom of the cask. As the wood dried cracks appeared, creating sections which, steadily, over time became set scores, albeit with much regional and international variation. Darts is now widely played in many parts of the world, but especially in former Commonwealth countries, the Netherlands and Belgium, the United States and Scandinavia. There are two main professional governing bodies, the PDC and BDO, the latter being the longer running of the two. Given the presence of the sport in pubs and bars it is probably one of the largest participatory sports in the world. 501 is the standard version of the game in competition and the object is to “check out” by getting your score down to 50 or less before ending the game by reaching zero by either throwing a double or a bullseye with your final dart. Darts only requires a board and the darts themselves, this limited list of equipment being one of the reasons for its success. The board that is now used as standard was created in 1896 by a Lancashire carpenter with the aim of penalising inaccurate throwing by keeping large numbers apart and bordering them with small numbers. Whilst mathematicians have long argued over the best board layout to minimise the reward for inaccurate efforts, the current design is actually pretty good. The board itself is made from compressed sisal fibres and despite modern electronic versions is now the accepted norm. In the early days after the First World War darts was played using a heavy, solid wood board, normally made from elm and subsequently clay versions were trialled. The standard board is 17¾ inches (451mm) in diameter and is divided into 20 radial sections by thin metal wire. The sections are numbered from 1-20 and contain a thin section at the outer edge (double) and slightly smaller area midway towards the centre (treble). The bullseye or “bull” is a small circle, usually red, at the very centre of the board and is surrounded by the larger, green, outer bull. The darts are usually used using a combination of metal, nylon and plastic for the points, barrels, shafts and fletching. The exact style and make-up of the dart will vary according to the player’s style and ability (or what pub you’re in!) but they must weigh no more than 50g and be no longer than 300mm. A player scores points by throwing the darts at the board. Each player throws three darts on their turn with the maximum score being 180, achieved by hitting three treble 20s. The bull is worth 50 points, the outer bull 25 points and the various numbers score their own value, unless they are doubled (the outer rim) or trebled. To win a player must reach zero by hitting a double or a bull, having first got their score down from the 501 starting point. If they do that they win the leg and the first to three legs wins the set. Most matches are normally played “best of” a defined (odd) number of sets, with the sport’s biggest prize, the PDC World Championship, involving a final that is best of 13 (therefore the winner is the first to seven sets). 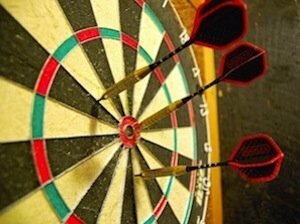 Which player takes the first turn in a game is decided by throwing a single dart each with the nearest to the bull taking the first throw. A throw consists of throwing three darts unless the game is won in fewer. Only darts in the board at the end of the throw are counted and ones that bounce or fall out cannot be thrown again. If a player scores more than their remaining points total their throw ends and is scored zero (for example if they have 16 remaining and accidentally hit a 20 with their first dart). The centre of the bull should be exactly 5ft 8in (1.73 metres) high. Darts are thrown from a clearly marked toe-line, often called the oche, at least 7ft 9 ¼ in from the board, measured horizontally.